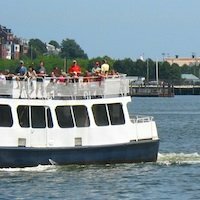 Looking for inexpensive Fenway Park hotels? 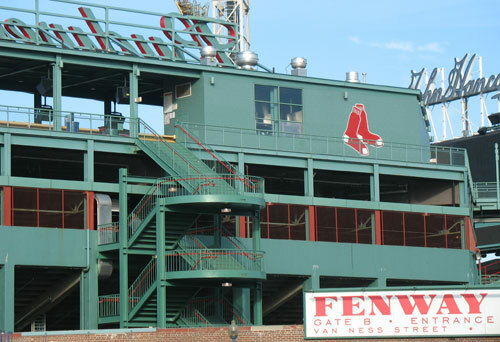 One of the city's best cheap hotels, Boston Hotel Buckminster offers low rates and comfortable accommodations within sight of the famed Red Sox ball park. It's also near Boston University. 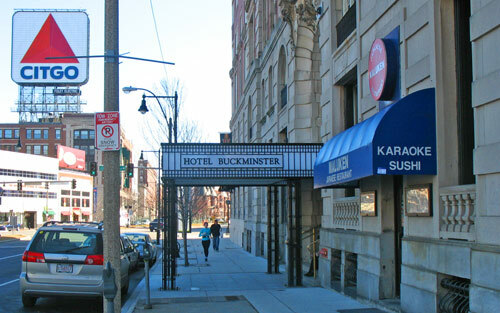 The Buckminster Hotel may be your top pick if you're looking for cheap Boston hotels as close as possible to Fenway Park . . . plus all of the nearby Boston nightlife spots and Boston bars near Fenway along Lansdowne Street and Brookline Ave. Built in 1897, the Hotel Buckminster Boston looks distinctive and almost modern. From Commonwealth Avenue, the attractive rounded front of the triangular building is an eye-catcher. But turn the corner onto Brookline Ave, walk about 100 feet . . . and suddenly, if you look up, you'll see the top of the Green Monster. Yes, Fenway is that close! How close? Only a block and a half. You walk across the Mass Pike overpass - and you're there. On game days and nights, this is the most exciting spot in the city. And if you should happen to stop at a few Fenway bars and nightclubs after the game, you'll fully appreciate the 3-minute walk back to your hotel. 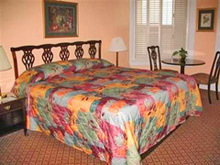 The Buckminster Hotel has 70 rooms and 24 suites. They're not fancy, nor is the lobby - remember, you'll find affordable rates here, not gilt and frills - but the staff is friendly and helpful, and the hotel is clean and comfortable. If you want a luxury hotel, the Buckminster Hotel isn't for you. But if you'd rather spend your money on great seats for a Red Sox game than on an expensive room with designer sheets, then the Buckminster may become your favorite Boston hotel. Even though the Buckminster Hotel usually offers great rates, don't forget to check rates from a few booking agencies to make sure you get the best one. Like most Boston buildings, the Boston Hotel Buckminster has an interesting history. Designed by famed architect Stanford White who also designed the Boston Public Library and many of the elegant Back Bay mansions on nearby Beacon Street, the Buckminster was one of the first hotels built in the Boston area. Radio fans will enjoy knowing that the Buckminster Hotel was the site of a special "first" in the history of the news media. WNAC Radio moved into new studios in the building in 1929 and working with WEAF in New York, arranged the first network radio broadcast . . . using a 100-foot antenna attached to the building's roof with clothesline. What else besides Fenway Park is nearby? 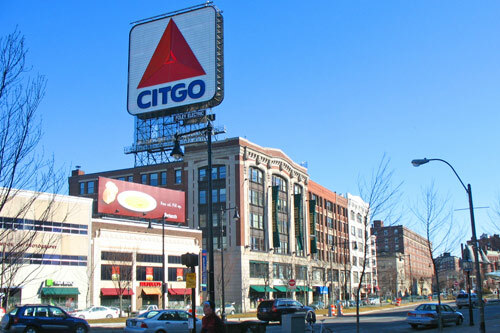 The New England School of Photography is across the street from the Buckminister Hotel, and Boston's iconic Citgo sign is down the street. 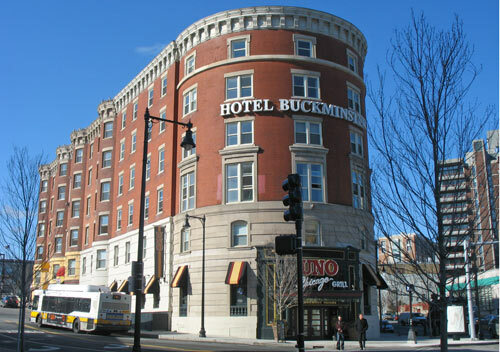 The Buckminister is also one of the best hotels near Boston University. Eastern campus buildings stretch along Commonweath Ave to the west of the hotel, all within an easy walk. Berklee School of Music is also a few blocks away, along with Northeastern University, Forsyth School of Dental Hygiene, and the Fenway Colleges - Wheelock College, Simmons College, Emmanuel College, and several others. The Boston Hotel Buckminister is just a short walk from all of them. If you're more interested in Boston cultural attractions than sports, you'll also find Symphony Hall, Jordan Hall, the Museum of Fine Arts, and the Isabella Stuart Gardner Museum in the hotel's Fenway neighborhood. The heart of Back Bay's Newbury Street shopping area is just a 10 minute walk to the east. If you want to take the subway, Kenmore Station on the Green Line is just a couple of blocks away. You'll find a number of casual and fast-food type restaurants in the immediate vicinity of the hotel, and a karaoke-sushi place next door. Make sure you find the best rates and visitor reviews for Hotel Buckminster. Check each offered deal carefully to see if any hotel specials such as discounted or free parking are included.